Add the tomatoes, mashed with a fork, parmesan cheese, oregano and parsley. Season with salt and pepper and simmer gently. 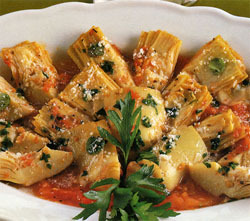 Spoon over marinated artichokes already arranged in a dish.